Join us. Lead the way. Park Leadership Society donors are civic leaders who recognize that we need to care for our parks today if we want to enjoy them tomorrow. You care about this City, you recognize the tremendous value of having safe and clean places for children to play, and you want to protect and preserve these treasured landmarks. 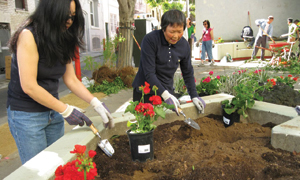 As a Park Leadership Society donor, you are making a commitment to community building in San Francisco. SFPA is dedicated to ensuring that all parks remain community assets that will improve the quality of life for all Bay Area residents. Your donation supports our City’s parks, playgrounds, open spaces and recreation centers. Our organization funds much needed park improvements, helps shape park policies and planning to reflect community needs, encourages park use, and cultivates a sense of stewardship, while building community engagement and support for parks. Since 1971, Park Leadership Society donors have championed the cause for parks and recreation by providing generous financial support. By joining this distinguished group you provide funding for essential park projects, opportunities for neighborhood park groups to achieve their goals, education and stewardship, and a brighter future for our parks. Park Leadership Society donors make annual contributions of $1,000 and more to the San Francisco Parks Alliance.